These inventive needles practically thread themselves. 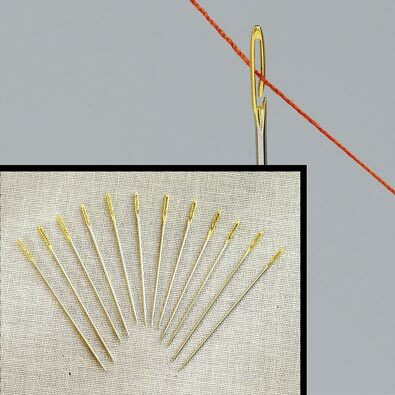 Based on precision technology these needles have open eyes that let the thread slide in, but then hold it like an ordinary needle. No more wasted time and annoyance. Set of 24 assorted sized needles. The Bead Weaving Loom Kit is a wood and metal bead loom set for creating patterned bracelets, necklaces and more. This easy to use jewelry maker lets you design colourful, personalized gifts for friends and family. Weave different colour beads together to create interesting patterns and designs. Adult supervision recommended. • Makes a great gift for kids for the holidays! •Recommended for ages 12+. Includes small parts.